This entry was posted on December 1, 2017 by MidMeds. You blink and suddenly it's the festive season again! Here at MidMeds we've had a whirlwind year, this Summer we moved to our bigger and better home in the great town of Hertford. Our bigger office and warehouse means quicker deliveries, cheaper prices and an even bigger customer support team to ensure we are always there to take your call. We hope you've had a great year also! Although times are hard and budgets continue to get slimmer, we're working hard to ensure prices are as low as possible to help your practice through this uncertain period. 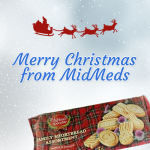 It has become something of a tradition in the past few years, for MidMeds to include free shortbread in orders, well it's back this year! Simply place an order of over £75 to receive a free box of delicious shortbread! It's our little way of saying thank you for your support over the past year.